Here are the champions from the 2019 $25,000 added Open Bridle Spectacular sponsored by Holy Cow Performance Horses. In a stacked field of 34 entries, it was Shane Steffen and Gunna Be A Smartie (Very Smart Remedy X Gunna Be Mine X Gunna Smoke), owned by McSpyder Ranch, that came out on top. Steffen, of Powell Butte, Oregon, piloted the 7-year-old mare to a 219.5 in the herd work, a 222.5 in the rein work and an incredible 224 down the fence. In addition to being crowned Open Bridle Spectacular champions, they were also crowned champions of the Intermediate Open Bridle Spectacular. The dual wins earned $13,864 for owner Linda McMahon of McSpyder Ranch. 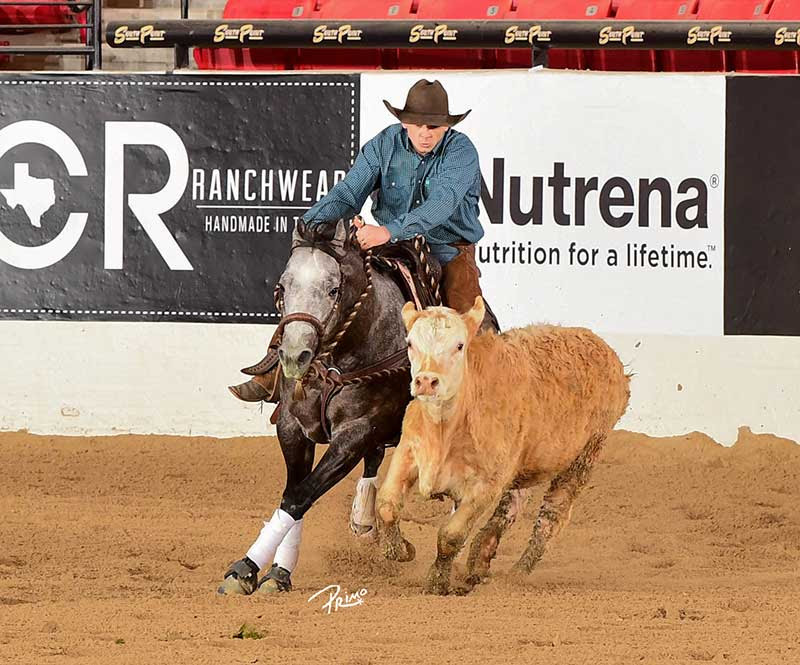 It was just one year ago when Steffen and Gunna Be A Smartie were crowned Open Two Rein Spectacular champions at the NRCHA Stallion Stakes. Danny Perez posted large scores in the $5,000 added Non Pro Limited Spectacular that resulted in winning two championships and a $5,225 paycheck. Perez, of Westley. California, piloted Red Carpet Style (CD Lights X Stylish N Shiney X Shining Spark) to a 146 in the herd work, a 147 in the rein work and a 144.5 in the cow work. 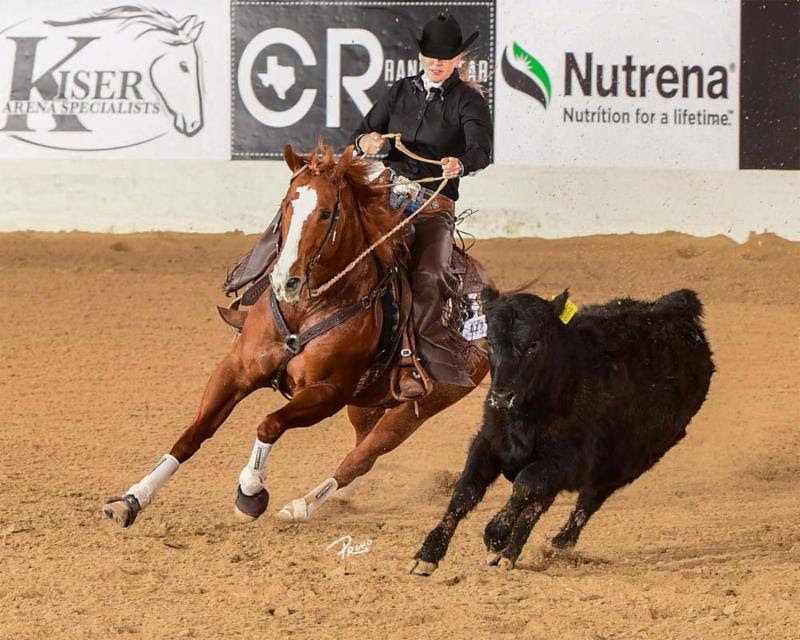 Perez was crowned the Non Pro Limited Spectacular and Non Pro Limited champion at the 2019 NRCHA Stallion Stakes. 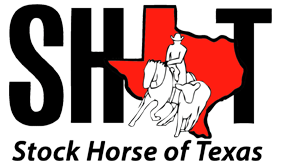 Perez is a longtime NRCHA non pro competitor and promoter of the sport. 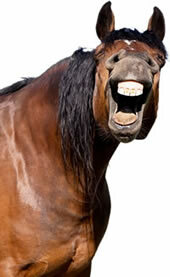 He is also a devoted owner, and more specifically the owner of a great cow horse Brother Jackson. 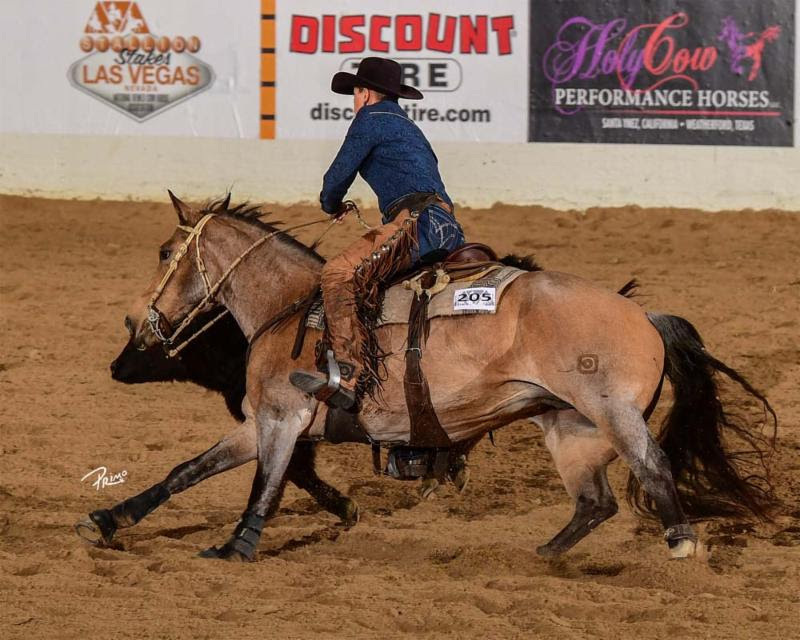 Fresh off of their Tres Osos Cow Horse Derby Non Pro win, Toni Hagen Heath and Legend De Lena (Smart Peppy Doc X My Legend Del Cielo X Gallo Del Cielo) captured the Stakes Non Pro Hackamore championship with a 293.5 composite score. The home-bred mare, owned by Toni’s husband Dan, earned $1,690 for the win. Cayley Wilson captured his second win of the show, but this time in the Open Hackamore, aboard LHR Rey C Time (One Time Pepto X Rey Jay Play X Dual Rey). Wilson piloted the 5-year-old stallion, owned by Fred Wein, to a 145.5 in the rein work and 145 in the cow work, for a composite of 290.5 and a $1,980 win check. Taking the Intermediate Open Hackamore win home to Belle Plaine, Minnesota, is NRCHA professional Ryan Gallentine. Gallentine rode Hes A Leap Of Faith (Cat Man Do X Playgun Sunette X Playgun) to a 282 composite (140 rein/142 cow), earning a $480 paycheck for owner Cindy LaPointe. Sunni McCormick and Just Call Me Earl (Once In A Blu Boon X CP Peekn Sneakn Blue X Peeka Pep) were crowned champions in the Limited Open Hackamore. 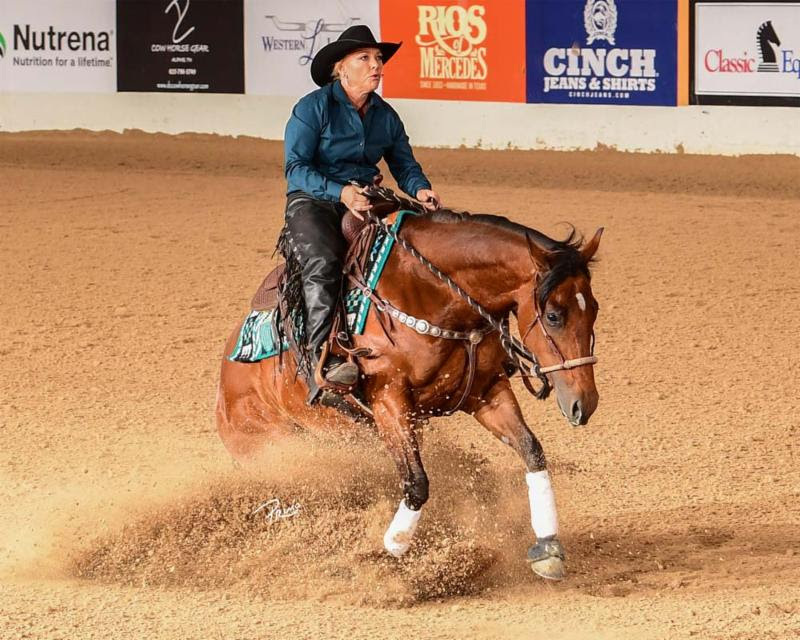 McCormick, of Temecula, California, showed Devon Camilleri’s 4-year-old gelding to 144 in the reining and a 139 down the fence for a 283 composite. The championship title is accompanied with a $1,200 win check. 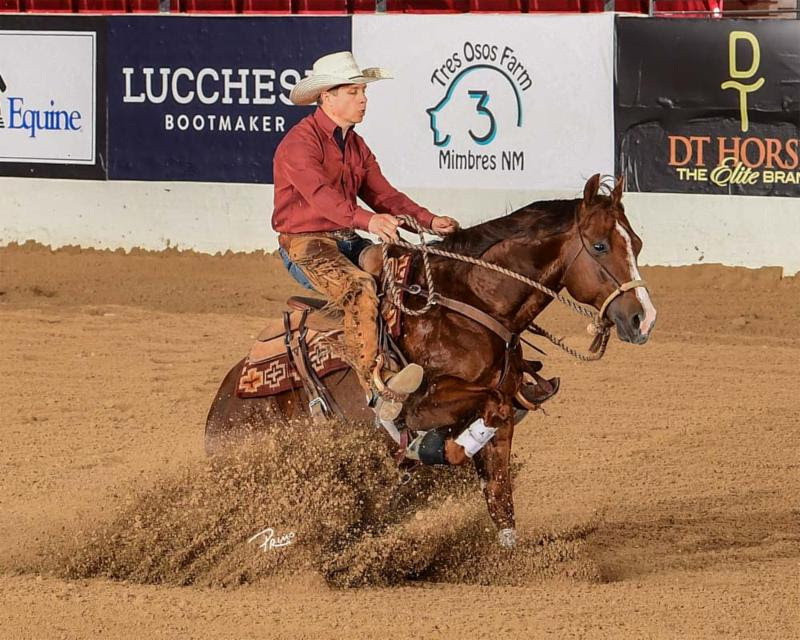 Clark Weaver and Lillys Vaquero (Cat T Masterson X Rs Lilly Starlight X Grays Starlight) captured their first NRCHA premier event win together. Weaver piloted his 6-year-old stallion to the Non Pro Two Rein Spectacular and Non Pro Two Rein championship titles. The pair earned a combined paycheck of $4,500 thanks to their scores of 141.5 in the herd, 146.5 in the reining and 145.5 down the fence. Cutter McLaughlin and veteran bridle horse CD Dee Vee Dee (CD Lights X Shiners Missy Jay X Shining Spark) added two more premier event titles to thier list of accolades. McLaughlin’s impressive scores of 147 in the herd work, 146 in the rein work and 150.5 in the cow work sent him to the top of the $10,000 added Non Pro Bridle Spectacular and Non Pro Bridle. McLaughlin earned over $7,800 for the combined wins. Garrell Reilly Williams and Sparks On The Fence (Smart Boons X Spark Chic Olena X Smart Chic Olena) captured two championship titles and a win check totaling more than $5,000. Williams, of Casa Grande, Arizona, guided “Carlee” to a 146.5 in the rein work and 148.5 in the fence work, to win the Intermediate Non Pro Bridle and Novice Non Pro Bridle. 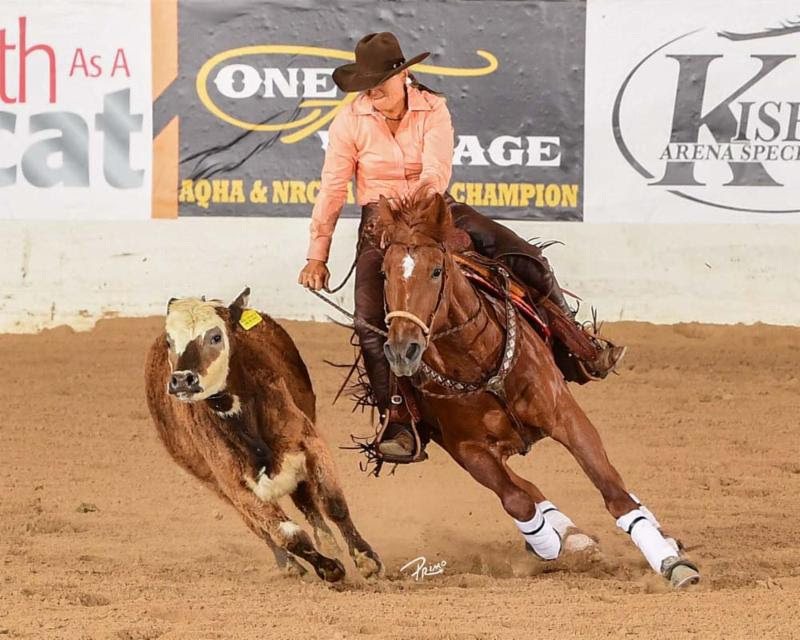 Nebraska cowgirl Jecca Ostrander won $250 in the Select Non Pro Bridle aboard her home-bred mare, BoxO Valentines Cat (Palo Duro Cat X Tracis Blue Roan X Roan Ambrose). The 281 composite (141.5 rein/139.5 cow) secured the win.